When the Easter season approaches, the yeasty aroma of freshly baked bread and sugary sweetness of flaky pastries and cakes fill kitchens as cooks prepare the foods associated with this important religious holiday. Easter is steeped in religious practices but also rich in food traditions that stretch back centuries: from the Last Supper, which in Christian theology is the day Jesus and his apostles shared a final meal, to today, when we still gather for festive meals on Easter Sunday. Growing up in a traditional Polish Catholic home in Milwaukee, Peter Burzynski understood from a young age that Easter was the most important holiday of the year. His parents, both immigrants from Poland, opened Polonez Restaurant in 1983, where Burzynski now works as executive sous-chef. While many traditional foods grace the Easter table, baked goods, especially sweet and buttery breads, are essential to the meal. This is, in part, because of the deprivation that precedes it. In the past, devout Christians observed a strict fast during Lent, the six or seven weeks before Easter, when they abstained from eating animal products of any kind, including red meat, milk, poultry, butter, cheese, and eggs, as a form of penitence. In some parts of Europe, sugar, honey, and olive oil were also forbidden. While few follow such strict fasts today, the tradition of feasting on special foods is still common. These Lenten fasts make the Shrove Tuesday (or Fat Tuesday) preceding it and the Easter feast following it all the more indulgent. The pastry Burzynski most closely associates with the season is one Poles eat the day before Ash Wednesday. It’s called a pączek, but is more commonly known in the U.S. by its plural form, pączki. “The pronunciation is almost as tricky as getting your mouth around one of these huge doughnuts,” he says. Burzynski says the correct pronunciation is closer to “pone-chykey,” not the “poonch-key” he so often hears in Milwaukee. PaczkiCrispy on the outside but soft and yielding on the inside, pączki are made from an especially rich dough of lard, milk, and eggs that is fried and then filled. They were originally created to clear out pantries of fruit, sugar, and fat for Lent. The earliest Wisconsinites adhered to Easter fasts. In 1661, Jesuit Father Rene Menard complained to his superiors in Quebec of harsh weather along Chequamegon Bay that limited the amount of fish so “those who wished to keep Lent suffered greatly.” Fortunately, the cold did not congeal his communion wine, and an abundance of moose after the holiday helped to refortify the supplicants. Baked goods were also likely off the table. Easter dinner looked better in the 1830s. General Albert G. Ellis recalled American settlers, army officers, and Christianized Indians strictly observing a Lenten fast. “They ceased gormandizing ducks, venison, and porcupine, only to feast in more epicurean style on trout, sturgeon, and wild rice,” Ellis wrote. When Easter arrived, “the most joyous of the calendar,” they all gathered in the woods amidst the sugarbush to feast on roasted chicken, eggs, and fresh maple syrup. Easter is a colorful patchwork of customs drawn from pagan and Christian traditions. Celebrations of the spring equinox were common in pre-Christian times. Early Church leaders recognized that eliminating all pagan customs and replacing them with religious ones might devastate the progress of the faith. So Christianity absorbed some of the old traditions as the custom of welcoming spring merged with the Christian celebration of Christ’s resurrection. The name of the holiday itself comes from the Anglo-Saxon goddess of light and spring, Eostre. This convergence of traditions is perhaps most apparent in the changing date of Easter. Rather than a fixed holiday, Easter is instead governed by the phases of the moon. At the First Council of Nicaea in 325 CE, Christian bishops set Easter as the first Sunday after the first full moon following the March equinox. Mesopotamian Christians were the first to adopt eggs as Easter food, though eggs had a long symbolic history as representations of rebirth and rejuvenation. Eggs were often exchanged as part of the celebration of spring. Christians were the first to dye the eggs red to represent Christ’s blood and resurrection. These red eggs, traditionally dyed with the skins of red onions, are often nestled in Easter breads, like Armenian choreg. “It’s the singular pastry of an Armenian Easter,” says Terry Peterson, describing choreg, a triple-braided egg bread. Her grandparents emigrated to Milwaukee from Armenia in the 1920s. Only minimally sweet, choreg is flavored with mahleb, the ground pits of St. Lucy’s cherry, that give the bread its distinctive flavor. The mahleb is ground so fine that Peterson says it something you can taste rather than see. “And it must be there because it doesn’t taste right otherwise,” she says. Both siblings love katah, a flaky layered biscuit similar to a croissant common at most holidays. “It’s loaded with butter and delicious,” says Hadjinian, chuckling. Although Peterson grew up steeped in her Armenian heritage, she didn’t learn how to bake these traditional foods until she helped to organize cooking classes with some elderly women at Holy Resurrection Church in South Milwaukee. Armenian breads are rolled out with special rolling pins called grdnak, a kind of fat dowel roughly three feet in length. Women customarily received their own rolling pin when they became engaged, along with a copy of the 1950s cookbook Treasured Armenian Recipes. “It’s a rite of passage. It’s how you know you’ve arrived!” Peterson says, with a laugh. Like a treasured chef’s knife, everyone brings their own rolling pin to the cooking classes. Peterson uses the one that belonged to her grandmother. The tradition of baking bread as a religious offering dates back to antiquity. The ancient Egyptians offered small round cakes to the goddess of the moon, each marked with her symbol, the horns of an ox. The three braids of the Armenian choreg and other bread shapes aren’t just beautiful; they are meaningful. Three strands represent the Holy Trinity. Wreath and ring-shaped breads represent Christ’s crown of thorns while also harking back to pagan fertility symbols. Round breads represent the life-giving sun, rebirth, and resurrection. The most famous of the round breads may be the British hot-cross buns. Baked on Good Friday, these slightly sweet circular buns often have dried fruit and chopped fruit peel in the dough. The bread gets its name from the cross cut in the top of each bun before baking. Superstitions regarding bread baked on Good Friday date back centuries. In England particularly, many people believed that Good Friday bread would never mold, so a bun was hung in the house to keep away bad luck for the year ahead. 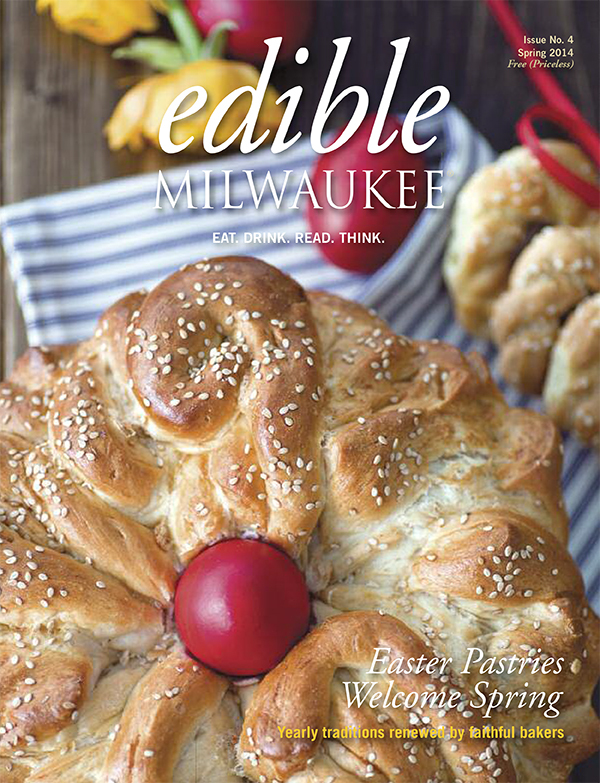 Grebe’s Bakery in Jackson Park and Regina’s Bay Bakery in Whitefish Bay are among the Milwaukee area bakeries to make hot-cross buns. Greeks celebrate Easter with the sweet braids of tsoureki. “It’s a sacred, holy bread. The smell of it baking warms you inside and lets you know the holidays are coming,” says Eleni Katrantzis, daughter of Aleka Tsioulos of the eponymous Aleka’s Kitchen in Sheboygan. Tsoureki is an eggy bread seasoned with mahlepi (the Greek version of mahleb) and mastic, the hardened resin of the mastic tree from the Greek island of Chios, the only place in the world where the tree exudes its aromatic, piney resin. The addition and type of other spices and flavors in the tsoureki varies by region and family. As does the adornment atop the freshly baked tsoureki. Like choreg, bright red eggs nestle in the braided strands of tsoureki, symbolizing Christ’s blood. The person who successfully cracks both ends of the egg belonging to the other player is said to have good luck for the year. Katrantzis and her sister Demitra Tsioulos grew up in Sheboygan, a town with a strong German, not Greek, heritage. They recall feeling out of place when they stepped out the front door of the home that their Greek immigrant parents had so immersed in the smells, tastes, and perspectives of their home country. Their mom, Aleka, was eager to share her heritage, though, and frequently invited non-Greek guests over to eat. Cake and kolaczkiBoth women remember helping their mom in the kitchen as children. She usually gave them the mundane tasks, like “stirring milk for 40 minutes without stopping to make a custard,” laughs Tsioulos. But these monotonous, detailed tasks gave them a deep appreciation of their culture. While tsoureki is the central Easter pastry, it isn’t the only sweet treat on the Greek Easter table. Shortbread-like cookies known as kourabiedes, made with almond paste and covered in powdered sugar, are common at nearly all Greek holidays. Galaktoboureko, a creamy and sweet custard pie baked in phyllo and drenched in lemon and honey is another indulgent favorite of Tsioulos and Katrantzis. Baking stirs memories and connections to family, culture, and home. “These pastries have more than ingredients in them,” says Tsioulos. “They are filled with stories passed down through the generations.